Below is an excellent article from "The Mountain Eagle" about the Stamford trail system which includes the top of Scotch Valley. Used with permission. STAMFORD - Trails for hiking, biking, skiing and snowmobiling in the Stamford area are an untapped recreational resource. Landowner Doug Murphy guided a group over miles of trails in the village’s backyard on Oct. 7. Greater Stamford Area Chamber of Commerce members Velga Kundzin-Tan and Linda Stratigos are pushing forward in collaboration with Economic Development Specialist Phil Sireci, of the Catskill Watershed Corporation, to map and improve the trail system. Murphy, along with interested residents and business owners, would like to better utilize the trails and land by creating an organized, attractive, mapped out, trail system for residents and tourists. Grants are being sought to further maintain the trails and incorporate features like signage, maps, picnic tables and a kiosk. Although an Appalachian Regional Trail Commission grant was denied, Sireci said doesn’t mean other available grants won’t come through in the future. According to Kundzins-Tan, Murphy’s father, William (Bill), began clearing the land 40 years ago. Doug Murphy holds that same interest, and has many plans for the trails and the surrounding land. “I’ve been brought up to share this resource,” Murphy said. Murphy organizes horse rides for the Morgan Estate in early fall and this weekend mapped out a 25 mile competitive trail ride for Cobleskill College, also perennial visitors to the trails. Although vehicles are not preferred on the trails, he led a group of seven through the maze barely suitable for a motor vehicle and pointed out the attractive locations that hold significance. There were many historic features such as a portion of the original road to Jefferson, farmsteads and foundations, natural springs, mountain bike trails and beautiful views. There are few trails with signage. The only markers are arrows to direct snowmobilers, and even then, a snowmobile rider should have a good idea of his surroundings before adventuring out on an excursion. Murphy directed the crew to the Scotch Valley Trails, a popular tourist attraction in its heyday. 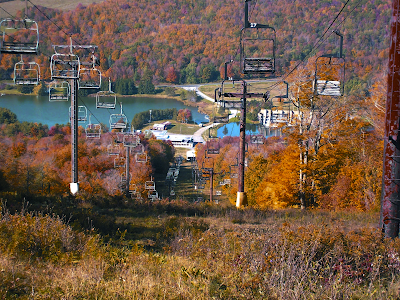 The lift and ski amenities are in disarray, but the land, woods and paths are as beautiful as any older snow bunny or regular mountain biker would remember. The site atop of the resort’s highest point could draw backpackers to sit and stay for lunch, while looking over the towns of Jefferson and Gilboa. But how to get there? Murphy and Sireci have plans o GPS the trails before developing an understandable and muli-dimensial map for those interested in utilizing the land. There are obstacles that the chamber of commerce, Murphy and The CWC are facing. “There is not an organization to care for the trails. The organization is a one-man team, which is Murphy,” Sireci said. According to Kundzins-Tan, there are issues over land ownership and jurisdiction. “The trails overlap and run across approximately 15 or 16 different property owners lands. To get everyone on the same page, with the same goals for the resource, may be a difficult. Also, the trails run over four different townships and two counties,” she said. Regardless of these obstacles, all parties involved in last week’s tour want to to progress with their plan, believing that it will be a resource to market the area. “There is an interest in an effort to market and publicize the trails,” Murphy said. John Gibbons, owner of the Belvedere Country Inn, has wanted to utilize the 30 miles of trials for years. Attempts to obtain grants will continue. “What we need a structure in place in place monitor the trails,” Sireci said.